To be completely honest, I believe the only way to capture Monterosso al Mare without hundreds of others has to be in low season and of course, during sunrise: I’m not saying it’s not worth it! Just be aware that the view can be slightly different if you visit Monterosso during summer. Vernazza was my favorite village in Cinque Terre. All the villages in Cinque Terre are beautiful, but Vernazza got me with its turquoise water and colorful view. My favorite viewpoint ever is located in between Vernazza in Monterosso. 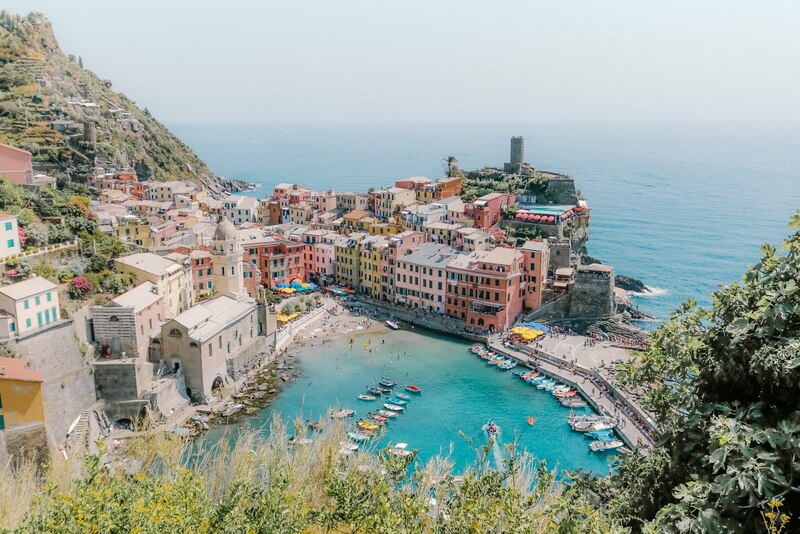 From there, Vernazza looks extra pretty! You need to pay 7,50€ to access the hiking trail and this instagrammable spot is just 15 minutes from the village. I’d recommend you going also after sunset (you don’t have to pay then) to enjoy the beauty of Vernazza during night time. Another beautiful viewpoint is located in between Vernazza and Corniglia. You need to pay 7,50€ again and the best view is just 10 minutes away from Vernazza. Vernazza is the only village in Cinque Terre with a natural harbor and a natural beach. This is the favorite for families and holiday makers, but you can also have a dip from the rocks with an incredible view to Vernazza. Corniglia is probably the least visited in Cinque Terre because its location, a bit further from the sea. However, it’s also pretty and totally worth a visit. Manarola views are something else. Up on the hill, the restaurant Nessun Forma has the most epic views in Manarola, which are also perfect for photo opportunities! The sunset from Nessun Dorma is something else. Take care if you plan to have a dip in Riomaggiore: I saw some people falling and hurting themselves because the rocks are quite slippery. The perfect photo in Riomaggiore is taken either from the viewpoint or from the rocks. Just choose a photogenic spot in Riomaggiore, there are plenty! If you travel to Cinque Terre for the photo opportunities and you’re short in time, focus and visit Vernaza, Riomaggiore and Manarola: they are the most photogenic and you can squeeze them in one only day. Forget about renting a car: the best way to get around Cinque Terre is by train. If you plan to visit all the villages, the Cinque Terre Pass (available at every train station) offers unlimited access for all the trains. If you plan to visit no more than 2 villages a day, then I’d suggest you booking single tickets. Download the train schedule on your phone on this site: There’s no train service at night! In peak season, if you don’t have the Cinque Terre Pass and you need to book the single ticket, go to the train station with a 30 minutes window so you won’t miss it. You can also book it in advance to avoid the queues. Don’t forget to tick your ticket before hopping on the train! Another way to explore Cinque Terre is by boat. This option may be a bit more expensive but it’s worth it if you don’t have enough time. In summer, bring your snorkel mask with you. The water is so pristine that you can even see the fishies from the surface, but the experience will be even better if you go in the water. As for the food, you will find the best gelato at Il Porticciolo in Vernazza, an awarded pizza at La Picea in Levanto (one train station away from Monterosso al Mare) and the best dinner with a view at Nessun Dorma, in Manarola.